Nakayama is the only custom knife maker who employs the art of Netsuke, a sort of traditional accessory worn by Samurai. 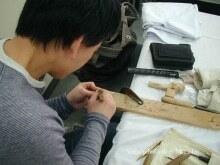 He followed Mr. Saitoh, a Netsuke artist, and a custom knife maker Uegama to train himself to be a custom knife maker. His Netsuke works of reptiles are very popular around the globe as they appear to be so real they even look they stir and move. His art knives are always sold out in every exhibition. Recently his ball point pens with a mechanism of bolt action of a rifle are so popular their counterfeits have appeared in China.